'The Shark' Has Died: Coach Jerry Tarkanian Was 84 : The Two-Way Famous for his ever-present white towel and what seemed to be a perpetually worried expression, former UNLV basketball coach Jerry Tarkanian has died. 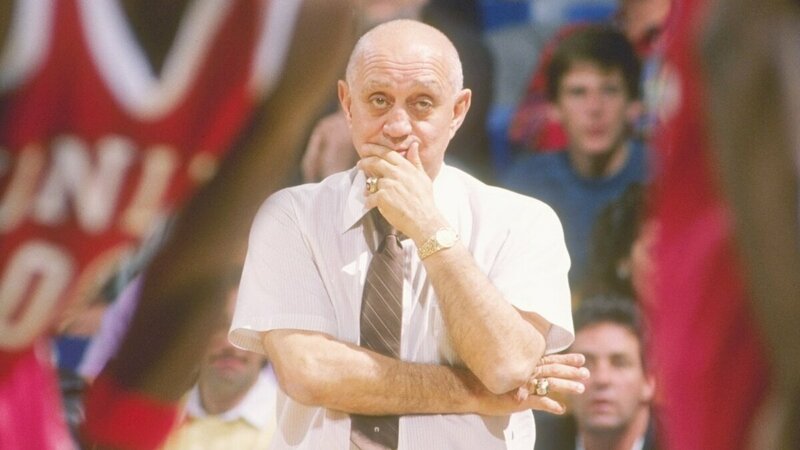 Head coach Jerry Tarkanian watches his UNLV Runnin' Rebels during the 1989-1990 season, when they would win the school's only NCAA men's basketball championship. Tarkanian died Wednesday at age 84. Famous for his ever-present white towel and what seemed to be a perpetually worried expression, former college basketball coach Jerry Tarkanian has died. He had been hospitalized in Las Vegas after fighting a string of ailments in the past year. The coach's son, Danny Tarkanian, announced on Twitter Wednesday that his father had died. The coach of the University of Nevada, Las Vegas Runnin' Rebels for 19 seasons, Tarkanian won an NCAA national championship with the team in 1990. He won more than 700 games in his career. He also took UNLV teams to the NCAA's Final Four 1977 and 1987. With the nickname "Tark the Shark," the coach created a program at UNLV with a knack for winning, using stifling defense and a fast-paced offense. He also brought a style that fit perfectly with the team's home in Las Vegas. "During Tarkanian's UNLV heyday from 1973 to 1992, the Rebels' home arena had special seats dubbed 'Gucci Row,' where celebs, including Frank Sinatra, would watch the team's thrilling up-tempo offense and amoeba defense, combining man-to-man and zone tactics. "For all his on-court battles, Tarkanian had some of his fiercest fights with the NCAA. He railed at what he thought was the organization's attempt to single out his unorthodox teams for investigation and punishment." In addition to UNLV, Tarkanian also coached at Long Beach State and Fresno State, where he returned to college ball after an abortive stint with the NBA's San Antonio Spurs. Tarkanian was inducted into Naismith Memorial Basketball Hall of Fame in 2013. In addition to being known for giving talented — if sometimes troubled — players a chance at a college career, Tarkanian was famous for the white towels he often chewed on during games. Tom says the towels were soaked in water, a holdover from Tarkanian's early days of coaching in high school gyms in Southern California that didn't have air conditioning. They became part of a nervous habit.